The Volcom Europe PBRJ Snowboard Contest Series is crashing into Innsbruck, Austria this Saturday! 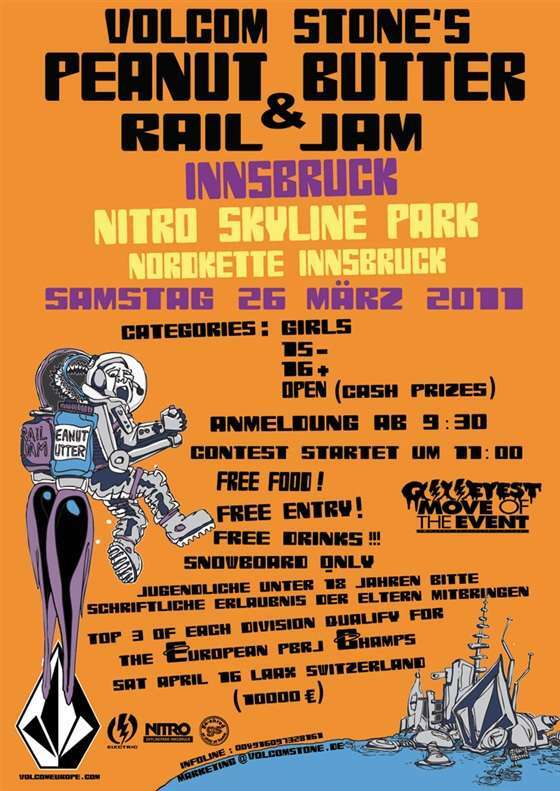 Meet up at the Nitro Snowline Park at Nordkette Saturday 26.06.2011. Registrations from 9.30, contest starts at 11.00! Free food, free drinks and the top 3 riders in every division at each stop will qualify for the European PBRJ Championships in LAAX, Switzerland on April 16, 2011. At the champs, there will be free accommodation, more prizes to win and 10.000 € prize money! See you there!